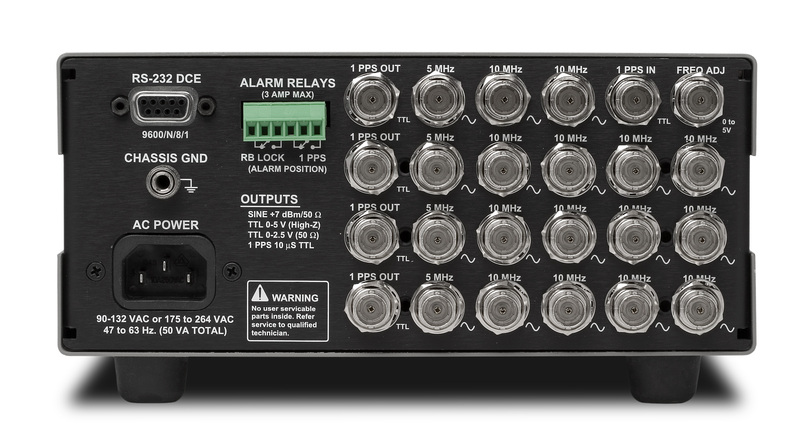 The FS725 integrates a rubidium oscillator (SRS model PRS10), a low noise universal AC power supply, and distribution amplifiers in a compact half-width 2U chassis. It provides stable and reliable performance, with an estimated 20 year aging of less than 5 × 10-9 and a demonstrated rubidium oscillator MTBF of over 200,000 hours. The FS725 is an ideal instrument for calibration and R&D laboratories, or any application requiring a precision frequency standard. User's Manual > FS740 GPS Frequency Std. There are two 10 MHz and one 5 MHz outputs with exceptionally low phase noise of ( -130 dBc/Hz at 10 Hz offset) and one second Allan Variance of (<2 × 10-11). The FS725 can be phase-locked to an external 1 pps reference (like GPS) providing Stratum 1 performance. A 1 pps output is also provided that has less than 1 ns of jitter, and may be set with 1 ns resolution. Up to three internal distribution modules can be added to the FS725. Each module has four 10 MHz outputs, one 5 MHz output, and one 1 pps output, all with the same low phase noise, harmonic distortion and jitter. 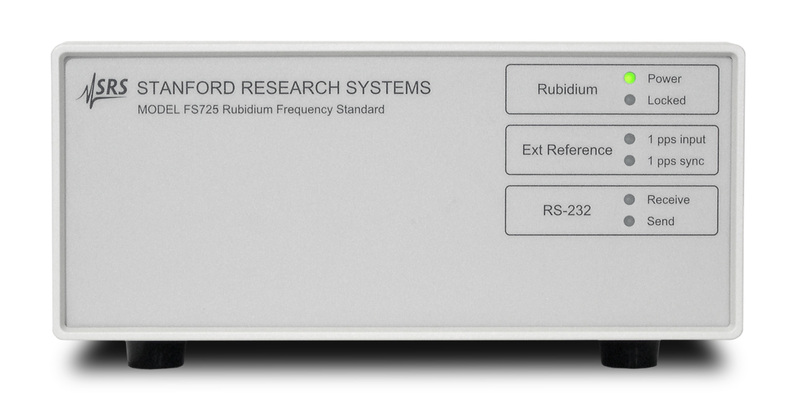 An RS-232 interface allows direct communication with the rubidium oscillator. Using the provided Windows software, you can easily monitor and control 1 pps timing, and determine the instrument's operational status. There are two alarm relays that indicate the status of the rubidium oscillator lock state and synchronization to an external 1pps input. The relays are SPDT, providing both normally-open and normally-closed contacts. 1 pps input One 100 kΩ input. Requires CMOS level pulses (0 to 5 VDC). If an external 1 pps input is applied, lock is maintained between the 1 pps input and 1 pps output with computer adjustable time constant from 8 minutes to 18 hours. Optional outputs Each option board provides four 10 MHz, one 5 MHz and one 1 pps outputs. Up to 3 boards can be installed. Alarm relays Max. current, 3 A. SPDT, normally open or normally closed. May be wired in parallel with other relays to "wire-or" a single alarm. Rb lock Relay status matches the front-panel "Locked" LED. RS-232 9-pin connector configured as DCE, 9600 baud. Windows RbMon software is provided.